We have a strong following for Clarice Cliff pottery. We offer a free valuation service to people who are considering the sale of their items through our auction room. Click the button to complete our short form, and one of our valuers will be in touch. Born in 1899, Clarice Cliff started work at the age of 13 as an apprentice enameller before joining A.P. Wilkinson’s Royal Staffordshire Pottery as a lithographer - she took art evening classes before setting up a studio in the pottery to decorate traditional whiteware. Her bright, bold designs were a huge commercial success, and she became Art Director of Wilkinson’s in 1930 - at its peak the factory employed up to 1,000 workers, including 150 decorators turning out the new designs. Although prolific in the 1920s and 30s, the factory never really recovered from the economic constraints of the Second World War and closed in 1964. Clarice was one of the most influential names in British design during the Art Deco period, and her work, with its strong colours and striking shapes, is still highly sought after. A rise in the number of collectors’ clubs has also kept the market buoyant, with rarer early work and certain patterns commanding a higher value. 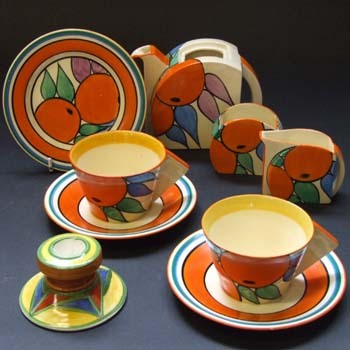 As with all pottery, the value of Clarice Cliff ceramics is largely dependent on the age and condition of the individual piece. The most sought after items are those made prior to 1935, and include her first pattern, Bizarre, produced between 1928 and 1930, and also Fantasque, a group name for eight designs begun in 1929 (both patterns are stamped with their name on the back). On the right of this page you will see a few highlights of Clarice Cliff items we've sold - to see more, including prices and dates, search our sold lot archives. 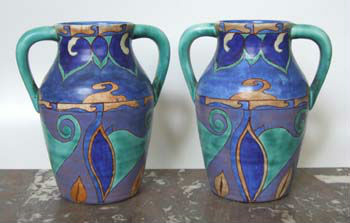 Below are a few highlights, or click here view all Clarice Cliff Pottery in our Sold Lots archive. Clarice Cliff, Isis vase cubist pattern.